Grind the salt pork and try out in a saucepan. When it begins to brown, add the onion, ground; parsley, chopped; shredded garlic and the mushrooms, previously soaked. When the vegetables are brown, add the meat, coarsely ground; and when that is brown, add the tomatoes. Simmer slowly till of a creamy consistency. Cook spaghetti, without breaking it, and drain carefully. Put into a hot serving dish, sprinkle one-half cup grated cheese over it, then pour the hot sauce over it. Lift with two forks till thoroughly mixed. 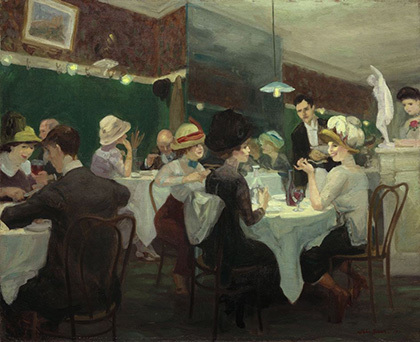 Image: John Sloan. Renganeschi's Saturday Night, 1912. Gift of Mary Otis Jenkins.